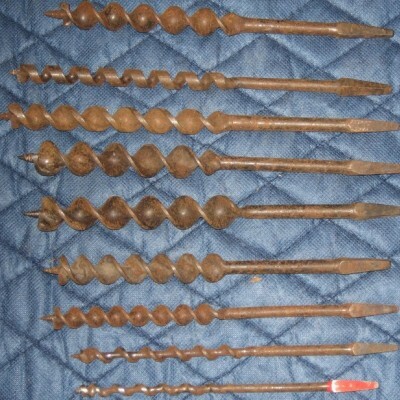 Set of nine twist drill bits of varying sizes. From smallest to largest: a) Small bit with a red block. Fairly rusted, no easily identifyable maker's mark. There is a "5" on the red block. b) Small - Medium bit, fairly rusted, no identifyable maker's mark, but there is a "6" on the back block. c) Medium bit, fairly rusted, no identifyable mark, but there may be a "9" on the back block. d) Medium Bit, fairly rusted, different style twist than the other bits, there is a "4" on the back block, but no distinguishable maker's mark. e) Medium - Large bit, Approx 8" in length, fairly rusted, and there are no identifyable marks. f) Large Bit, 10" in length, fairly rusted, not identifyable maker's marks. g) Medium - Large bit, 9" in length, fairly rusted, identifyable marks on the back block are a "12" and "JT Hugh / Philap" h) Large Bit, 9" in length, fairly rusted, marks on the back block include a "14" and "Black" i) Large bit, 9.5" in length, fairly rusted, but there are no identifyable marks.